Another beautiful travel day from our anchorage on the St. Mary River to Solomons/Calvert Marina. (Calvert was the original governor of Maryland). This marina is built on an old naval base that extends along much of the waterway in this part of rural Maryland where military exercises, both air and sea, are frequent. Additionally, the nation’s first amphibious training base was built here in the early 1940’s. There are huge off-shore docking stations for unloading petroleum destined for government use – no self-serve available. It all looks like a city-scape from the water. Clearly and happily we couldn’t get close enough for great pictures but it was an interesting ride as we had never seen anything like it. When calling in for a slip at Calvert’s the lady said she had nothing available as the Kady Krogans were hosting a rendezvous and about 40 of the boats had taken all of their floating docks. When I suggested that we were OK on a stationary dock she was willing to put us “out near the fuel dock,” at least a quarter-mile walk to the office and the laundry, and the pool was closed. On the up side of things, our dock hosted mostly weekend live-a-boards and was alive with crabbing activity. We saw and learned more about crabs that ever before: they release the females :), crabs migrate (not sure when or where), and they are feisty little buggers. If we are right, a female. An official crab trap/pot at the bottom of a floating marker. We do everything we can to miss these babies out on the water. We dinghied to the Calvert Museum and light house where a large festival was in progress. We perused the many docks and hundreds of boats before returning to our quiet T slip on L dock but not before finding three boats that we have met along the way – Allison Leigh, Lauryl Anne, and Day Break. It was time to provision so we borrowed the one hour marina courtesy car – a 31 year old Mercedes Benz! The seatbelts didn’t work and it was a noisy diesel but it got us there and back in rambling style. I spent $100 on food and Jim spent an equal amount at the hardware store – a fact of boating life! Among other things like varnish, he purchased a fire extinguisher for the fly bridge – seems like a good idea since that is where we spend most of our time. Laundry wasn’t going to be easy here so I decided to wait until the next stop. Bad idea, see Herrington Harbor marina. Saturday night we decided to visit the local dining establishment named Hidden Harbor which they also called The Bistro and that it was – a small and unpretentious place with good food, great service, friendly folks, and a huge map on the wall with the option to pin your home port which, of course, we did. Also found Vicki and Ron’s pin in Washington State from two years ago and likely hundreds of other Loopers! The trip from Solomons to Herring Bay/Herrington Harbor Marina was another gorgeous cruise. Lots of boats out from Naval minesweepers and container ships, to work boats, cruisers, sailboats and run-abouts. It was a summer Sunday. Herrington Harbor Marina was not a disappointment. The flowers are still in full bloom, the dock hands are cute (no pics) and there are huffy bikes to ride to the laundry. It is a resort area with beautiful pool (again closed on Labor day), work out room, great boaters lounges and even better wifi! Yea, the pictures all downloaded. The seat was a bit wobbly but bikes were complimentary. Shortly after our arrival a sailboat pulled into the slip next to us. We assumed they were regulars but not so. A late 30 something couple and their 2 ½ year old daughter, Hazel, had departed that day from Annapolis heading south to the Bahamas. Together they own a fitness machine repair business which they plan to maintain while cruising but, they report, if it doesn’t work, oh well! They seemed confident in both sailing and life, not something you see every day! We wished them well, even though we worried a little about the fact that they had no bimini in the cockpit as we are grateful every day for the Namaste’s sun protection. He reported that he is good at canvass and I’ll bet he is! Another noteworthy event was watching a 100’, custom, pleasure craft splash for the very first time. The “18 Reeler” took 28 months to build and is reportedly valued at 12M. A hundred or so folks attended the launch where after taking tide and current into account, they had 3” per side to lower her from the travel lift into the slip using huge foam pads along the hull for protection. The top half of the boat would be put into place by crane the next day which we didn’t stay to see. Oh yes, the name “18 Reeler” was selected by the owner who also owns the award-winning family business, Old Dominion Trucking Company. They really did seem like pretty ordinary folks with two tiny dogs in tow. Heritage Harbor North – likely where we will put the Namaste on the hard when we finish this Chesapeake Cruise. Heritage Harbor Marina boasted a laundry with three washers and three dryers – all new. I was excited as I had three large loads of very dirty clothes that needed attention. When I arrived another boating lady was madly changing loads but stopped to explain that only one dryer was working. She had three more loads to dry and then it would be my turn. Needless to say, about five hours later I had completed the task and decided that perhaps my home washer and dryer are what I miss most? The following morning we woke to clouds that quickly vanished into another perfect day on the Chesapeake as we headed to Annapolis and the famous Power Boat Show. Coming into Annapolis, besides the lighthouse we could see the Chesapeake Bay Bridge and the Naval Academy. I had luckily secured a slip on Back Creek, but very close to Severn River where downtown Annapolis is located. We continually comment that we have never seen so many boats anywhere in our lives. They are everywhere including anchored in the middle of the somewhat narrow river here. Upon arrival we secured the Namaste at Watergate Point Marina and took the water taxi to downtown Annapolis where we ate ice cream and supervised preparations for the boat show that begins on Thursday along with the Schooner Race Down the Bay and the arrival of Hurricane Michael. Should be a big day so stay tuned. 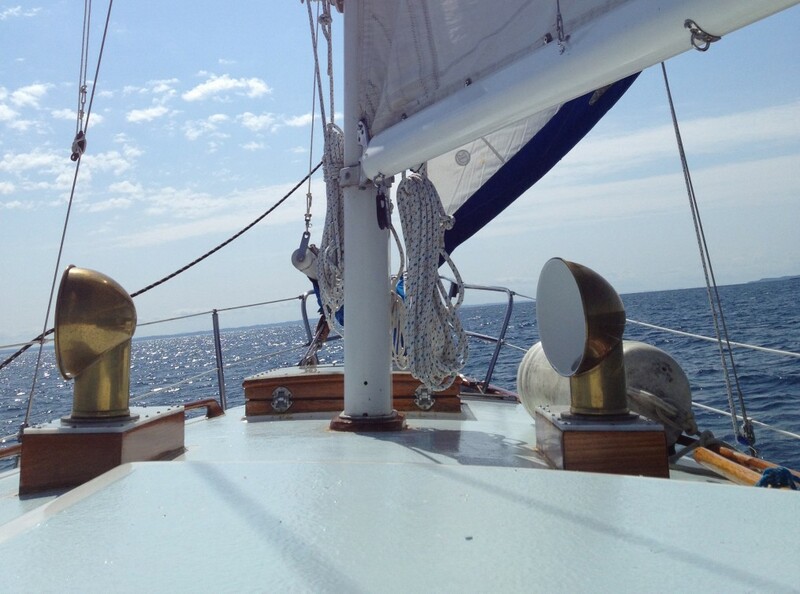 Play-time for the five children and two labs on the sailboat anchored just off our stern. Fun to watch! I have finally found a place to comment on your most recent post. I posted a short while ago way down the bottom somewhere while rereading your entire blog. It is so fascinating traveling with you. I know that Hurricane Michael passed by us and then the Panhandle took a direct hit at 155 mph and I know it was headed your way after crossing several southern states. It has now turned into a tropical storm. It left behind much devastation in Mexico City and Panama City. I hope and pray you are safe where you are. Keep blogging. I am enjoying “looping” with you. I am still marveling at the couple sailing to the Bahamas with little Hazel in such a small boat with no bimini. YIKES! Had to laugh as we borrowed the same Mercedes at Solomon’s island. Not much worked including the air conditioner but it got us there! Was the injured goose that wants to attack you still there? Really aggressive.